Adam Knave (Things Wrong With Me) joins Fes and Mark to discuss what it means to be a “comic”. There’s talk about Will Eisner and Scot McCloud’s definitions. 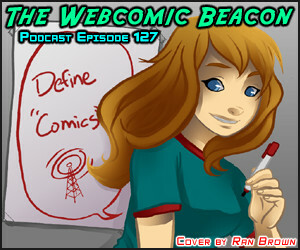 Ben Carver calls in once again and argues his definition of comics, much fun had by all! We also talk about a bit of Scott Pilgrim and ComicCon. Cover Art by: Ran Brown. 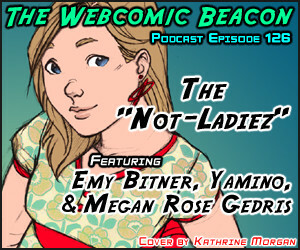 Yamino, Megan Rose Gedris, and Emy Bitner join Fes, Tanya, and Mark to talk about working as female cartoonists. Not as “ladies”, because that implies as more “proper and polite” attitude… apparently… We also wrap up by taking apart Marvel & DC’s bad interpretations of women superheroes.